Bolder steps are needed to make sure more people from disadvantaged areas go to university, an official report says. 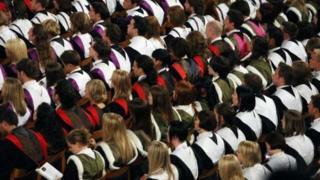 The Scottish government wants a fifth of students at each university to come from Scotland's poorest areas by 2030. In his report, the government's Fair Access Commissioner, Prof Sir Peter Scott, highlights good work already being done. But he warns this may not be sufficient and says universities and the government should do more. Generally, older universities have the smallest proportions of students from poorer areas. In his report, Sir Peter says: "All institutions must make a contribution to meeting the 2030 target. It is crucial that the ancient universities, which currently have the most privileged student intakes, play a full part - and a leadership role. "But it is equally important that the key role played by colleges, which enrol a much higher proportion of students from more deprived backgrounds, is respected and reinforced." How should Scottish universities reach the most disadvantaged? Sir Peter also suggests that more places should be available at universities to ensure that efforts to help those from disadvantaged areas do not make it harder for others to get in. The government has still to say whether new EU students who start in 2019 will still get free tuition or whether they will be charged fees. Sir Peter, who opposes Brexit, said he was making the point that these places should not disappear completely if the Scottish government decides not to continue with free tuition for EU students. Recently, Scotland's universities launched an action plan which they hope will allow them to meet government targets. This included a focus on contextualised admissions - this means taking more than school exam results into accent. Sir Peter called on universities to make "much bolder use" of adjusted offers and said they should also publish a detailed guide to their admissions processes to ensure full transparency. Shirley-Anne Somerville, the Scottish government's minister for further education, higher education and science, said: "Progress is being made - with latest figures showing that a record number of students from the 20% most-deprived areas in Scotland successfully gained a place at university in 2017." She added: "In particular, I welcome the Commissioner's view that free higher education for Scottish students provides the foundations on which fair access can be built. Similarly, we would echo his calls for universities to increase the number of students admitted directly from colleges and free up more college-university pathways. "We already invest over £1bn in higher education each year, including £51m a year to support approximately 7,000 places for access students and those progressing from college. But developing a truly fair system requires systemic change and will not be achieved simply by just expanding the system."